My oldest grandson's Bar-Mitzvah was a truly special event. He is a wonderful boy. He is loving. He is kind. He has a sense of humor. And he has Down Syndrome. My eldest daughter is a wonderful mother, who raised him to be the kind, loving young man he is today. 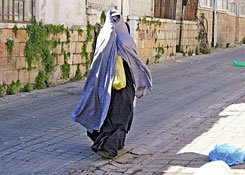 He has a wonderful Rabbi and Rebbetzin, who understand his situation, and show him love and kindness, gently moving him forward in Judaism, in small steps, so that he can feel the accomplishments; all the time, gently. The 'theme' for today's NaBloPoMo (which, in case you haven't a clue to what that word is, stands for "National Blog Posting Month" by BlogHer) is, "Which daily tasks take up the most of your energy (does getting out of bed count?)?" So I am posting instead, what energizes me the most: being with the people I love. Here are some photos of the milestone of Yaakov Yehoshua's Bar-Mitzvah. Obviously, we can't show you photos of the Shabbat service when he was called up to the Torah, but we can of the party motzai Shabbat, the first night of Chanukah. Rambo cutting up the dance floor! Rambo dancing with her nephew, the Bar-Mitzvah boy! 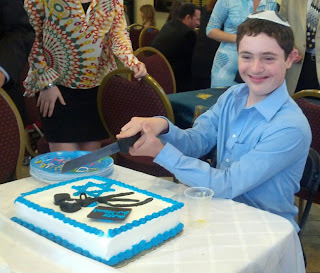 The Bar-Mitzvah boy cutting up the cake!